Decades ago, water hoses were just that–thin hoses of rubber that guided water from the spigot to your thumb pressed tightly over the end of the hose. Generally speaking, you aimed the water with your thumb pressure, taking breaks to occasionally untangle and undo the kink in the hose. Today’s hoses, however, are manufacturing marvels. The best will not kink. Some will not tangle. 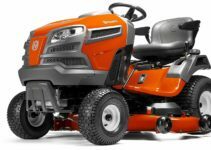 They have brass fitting connectors that make connecting and disconnecting the hose much easier than it ever has been. Unlike hoses of yesteryear, the best garden hose today is often lightweight. In order to choose the best garden hose look for the following things. For a hose, 25 feet will suffice, but a 50-foot hose allows more freedom to move. Anything longer than 50 feet might be heavy and hard to maneuver. Most hoses are 1/2 inch or 5/8 inch in diameter. Some larger, industrial hoses are 3/4 inch in diameter. However, the important thing is not the diameter of the hose but the size of the connector. You should look for a standard 3/4-inch connector that will connect to your spigot. Rubber hoses are not the best technology. They kink, get hot, and tangle. Additionally, they drag, increasing the perceived weight. Look for a hose with a smooth exterior and a mixed polymer material. If the material is advertised as being lightweight, you should examine how well it resists punctures or leaks. If the material is tough, you should ensure it is not too heavy. Additionally, you should determine if it is tangle free. Residential water pressure is typically rated at 150 pounds per square inch (PSI). At a minimum, the hose should be rated to withstand this pressure. Additionally, any fittings should be rated to withstand this internal pressure. Hoses are not meant to be operated with your thumb. If a hose does not come with attachments or extras, ensure it is one of the toughest, most versatile hoses on the market. Otherwise, look for one with nozzles, special fittings, or easy on-off connectors. Additional extras might include a storage case. 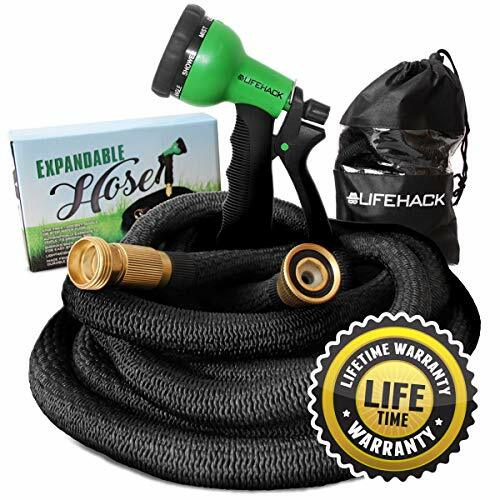 The expandable garden hose by MrLifeHack provides users a flexible, lightweight, 50-foot hose that makes all outdoor watering and cleaning an absolute breeze. The combination of rust-free brass fittings and protective rubber ensures this hose is 100-percent leak proof. 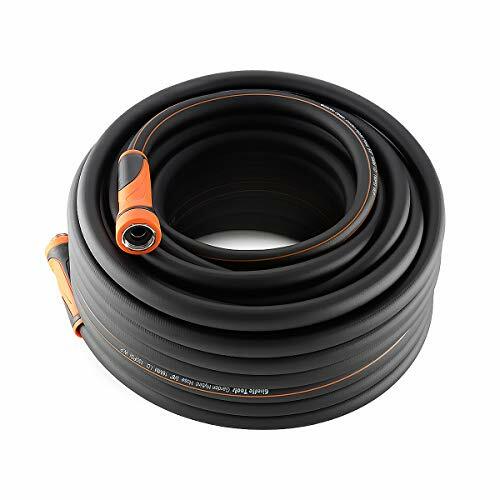 Made with a triple-layer, latex-core construction and high-quality fabric exterior, this hose is one of the strongest garden hoses on the market. Additionally, because of how firm the exterior is, the interior water flow is never interrupted, stalled, or stopped. Finally, storage is made easy as the hose expands to three times its original size. After use, it then shrinks back down, requiring very little storage space. The 2019 design upgrade includes a high-quality, durable, fabric core to protect against bursts. An upgrade to the four-layer, latex tube makes this hose more flexible. Additionally, compared to other two- or three-layer designs, it has a 300-percent strength rating. Finally, this hose offers a flexibility guarantee. Simply put, this hose will never twist, kink, tangle, or burst. Additionally, the anti-leak system incorporates an innovative design. For instance it is fitted with a leak-proof, no-rust, aircraft-aluminum seal, a brass shut-off valve, and a 3/4-inch brass connector. The no-kink hose is, of course, one of the best inventions since the invention of, well, the kinkable hose. Following that, a hose that will not leak is a true godsend. 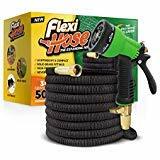 The Flexi Hose offers both features, no kinking and no leaking, ensuring little if any traditional frustrations as you are watering your lawn, garden, or flower beds. The first thing you want to do with this hose is run around spraying everything, and in order to fulfill this desire, you need a long hose. At first, the 17-foot hose seems rather minuscule. However, as water flows through it, it expands to a full 50 feet, ensuring nothing is truly safe from wanton watering. The brass connectors ensure a solid, no-rust connection. However, for convenience, one end is fitted with a solid-brass, on-off valve, which alleviates getting soaked as you exchange nozzles. Once you are done soaking anything and everything, the Flexi Hose collapses back to its original size, allowing easy winding and storage. Extras include a pistol-style nozzle with eight settings. collapsed hose is a little flimsy and hard to handle. Note: for best storage, thread the water out of the hose as it collapses. Any time a garden hose utilizes an indiscernible, 10-letter product code as its primary product name, you know you are facing an industrial powerhouse. With the HFZG575YWS model, you are in for an industrial treat. 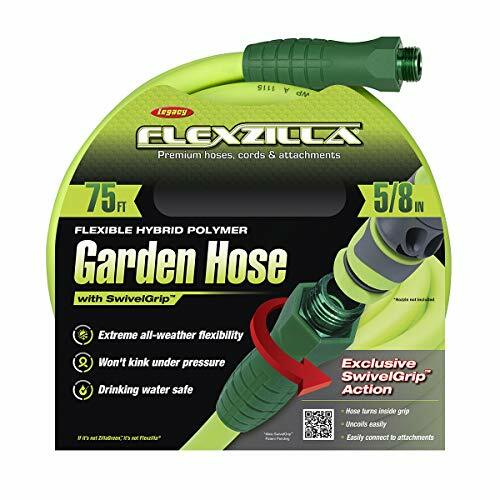 As the name says, this thing is the Godzilla of garden hoses. 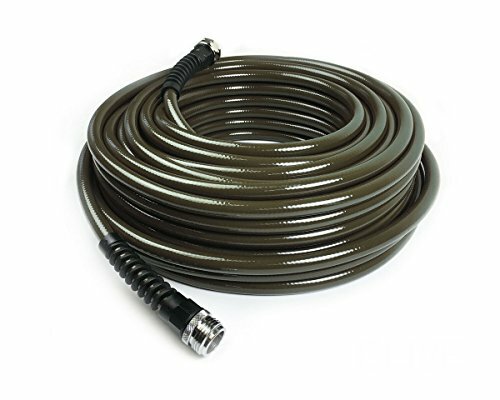 For starters, the hose is 5/8 inches of reinforced, hybrid, polymer. It is tangle free. There is nothing particularly surprising about the hose except it refuses to tangle. It just will not. After all, no one tells Godzilla what to do. One of the best features is that it is impervious to weather. Sun will not make it brittle. Winter will not make it stiff. Yes, this is a hose with a serious attitude problem. That said, it is fairly easy to get along with. The swivel nozzle makes tightening and loosening a breeze, and it bends around corners easily, of course, without kinking. Finally, it contains no toxic chemicals. As such, it is drinking-water safe. If you are nostalgic for the days of drinking water out of a warm, dirty hose–this hose is not for you. This hose does not come with extras. Basically, this hose is fantastic enough without extras. If you are not satisfied with Godzilla, go away. 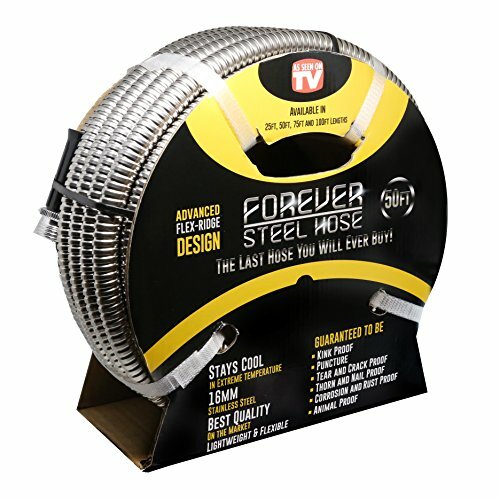 If the Flexzilla hose is the Godzilla of hoses, the Forever Steel Hose is the Terminator of hoses. It will not kink, and it will not tangle. Additionally, it will not puncture. It might seem like a marketing stunt to call this a steel hose. However, this hose is actually made of 16 mm stainless steel. That said, it is amazingly lightweight, flexible, and simple to use. The brass fittings ensure easy on-off connection, and the stainless-steel, exterior casing facilitates rolling it up and storing it. At 50 feet in length, it provides plenty of length, yet it remains light enough that it will not bog, drag, or pull you backward. The Nifty Grower is another expandable hose. Once you connect it to the spigot, the water hose starts out at a length of approximately 33 feet. However, it soon expands to its full 100-foot length. Even at one-hundred feet, it remains relatively lightweight and easy to pull around the yard. More importantly, as the hose fills with water, the latex core keeps it from tangling or kinking. If it gets wrapped around a tree or tangled in branches, the water pressure remains at full force. It offers an on-off valve for no-drip connection to nozzles and fixtures. The 3/4-inch connectors are standard for all spigots. Finally, it offers double O-rings to ensure it never leaks. The extra storage bag ensures you can wrap up the hose and store it. Unlike other hoses, it does not need to be coiled. It can be wrapped up and placed in the bag. The carrying bag has been reported by some as being a little small. 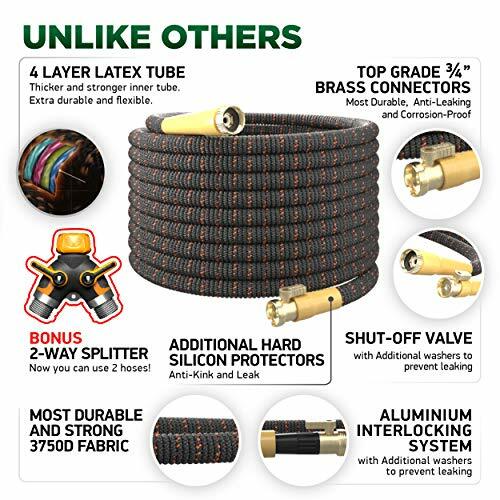 The Ultimate Best model is marketed as the world’s strongest, expandable garden hose. You cannot crush it. You cannot kink it. And you cannot tear it. Given marketing hyperbole, this hose might not actually be the toughest hose in the world–but it will likely be the toughest hose you have ever owned. The inner technology is a triple-core hose surrounded in flexible latex. Water pressure extends the hose, and the three cores ensure nothing ever interferes with the flow of water. The hose is available in four lengths: 25, 50, 75, and 100 feet. The brass fittings ensure easy on-off connection to your water spigot. They also ensure easy connection to the accompanying water nozzle. This water nozzle is a product unto itself and might normally be sold separately, but it is not. It is included–for free. It offers a contoured, pistol grip that fits comfortably in even the smallest of hands. Perhaps the best feature is that the water pressure is controlled by a thumb dial. Instead of having to squeeze a lever, the dial simply slides into place. The result is an effortless nozzle that can deliver powerful streams or broad-ranging fans of water. The Giraffe hose is a no-frills, all-weather hose that offers both kink-free and tangle-free operation. Its signature orange-and-black connector ensures an on-off connection that is both swift and leak-free. However, unlike other connectors, this one fits both male and female connections. It comes in a 50-foot version and a 100-foot version. A full two-year warranty ensures you get to use it–worry-free–through two complete seasons. The slick exterior resists dirt, the hose will not drag or pull on rough services. The Water Right 400-series hose looks like a standard hose of yesteryear. In most aspects it is. It is tough and durable. 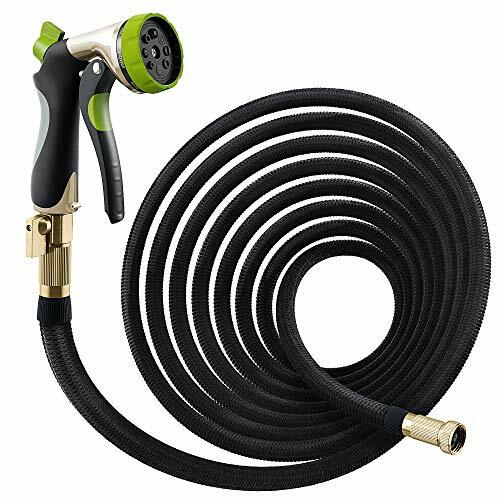 The brass connectors are lead-free, and the hose itself is lightweight, perfect for standard watering needs. The best feature is the kink-free material used at either end. Many times, if a hose is bent in an odd way, the hose will kink at the nozzle. On the Water Right 400, the reinforced ends prevent kinking at the nozzle. Note: the kink-free technology involves the hose not kinking “permanently.” This means it will kink. However, in a short period of time, the hose will expand and un-kink. So many water-hose companies advertise how their hoses are easy to use and store. 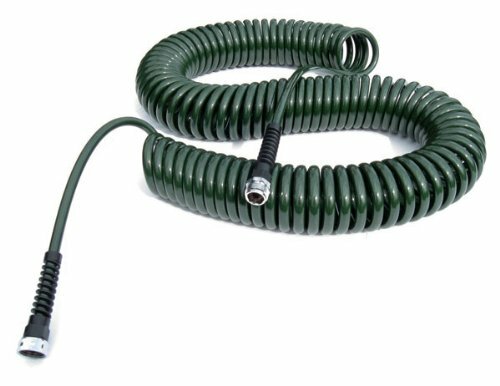 The Water Right Professional Coil Garden Hose is the one hose that is actually easy to use–and it stores easily. Simply put, this hose is amazing. In its coiled state, the entire hose is approximately 10 to 12 feet total. 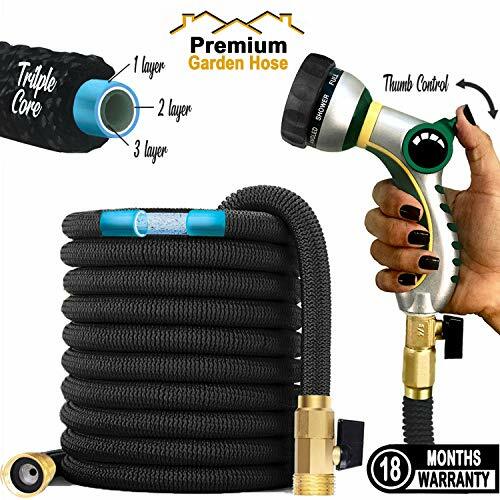 The tails on either end are 12 inches long, so the entire hose is extremely compact. However as you walk, it gradually unwinds, as necessary. You do not have to exert much pressure at all. You do not have to tug or pull and you do not have to walk back and untangle it. For the most part, the hose is engineered to anticipate your needs, and in that way, it seems very polite. When you are done watering, as you return to your spigot, it naturally re-coils. This is truly a compact hose. The connectors are brass and chrome, ensuring no leaks. Additionally, the material is phthalates-free, which means drinking from it is safe.